Wiggly eyes make these come to life! Wiggly eyes make these sun catcher frames come to life! Pre-attached eyes give each animal personality and deep raised borders make staining easy and fool-proof. All measure approx. 4" square. 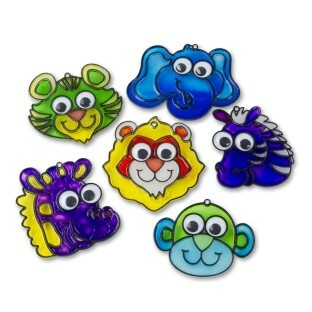 4 each of 6 styles: Elephant, Tiger, Lion, Zebra, Giraffe and Monkey. Ages 4-12 enjoyed this Vacation Bible School craft. Some put a bit too much paint and drying time was longer. Packaging needs improvement as alot had squished eyes when received.